Dwight Garner is a book critic for The New York Times. The only way to eat cherries, Gogol said, is to stuff about twenty in your mouth at once. That’s how, growing up in West Virginia, I ate my paternal grandmother’s string beans. I could get more of them onto a fork than you might think possible. Like all West Virginia cooks I know, she made them in a pressure cooker, along with a strip or two of bacon. The results were tender and porky and ambrosial. I came to regret eating so many at once. My grandfather was a devotee of Horace Fletcher (1849-1919), the health food maniac known as “the great masticator.” Fletcher believed you should chew each bite of food 32 times. So did, on some days, my grandfather. It was a good way, at the dinner table, to make one regret an otherwise perfect bite of twenty string beans. Lundy is a cookbook writer whose previous books include Shuck Beans, Stack Cakes, and Honest Fried Chicken. She’s a founder of the Southern Foodways Alliance and a two-time finalist for a James Beard Award. And she traveled for the recipes in this book: “To gather them, I drove over four thousand miles—zigzag on switchbacks, straight along ridgelines, weaving and loping through valleys, dark and light.” She made it back alive, with some toothsome recipes in tow. It’s been said that the only regional dish, if you can call it a dish, that West Virginia has introduced to the world is the pepperoni roll, a tasty one-handed miner’s lunch made by baking a stick of pepperoni inside yeasted bread dough; Lundy includes a solid recipe for those. She has a terrific recipe for pickled bologna with banana peppers, though she spells it “baloney,” which I’m on the fence about. This reminded me that the most satisfying sandwich of my youth, as introduced to me by my father, was a fried bologna sandwich. In his memoir Colored People, Henry Louis Gates, Jr., who was born in Keyser, West Virginia, writes with ardor about fried slices of a defunct brand called Dent Davis’ bologna, which to my regret I never tasted. 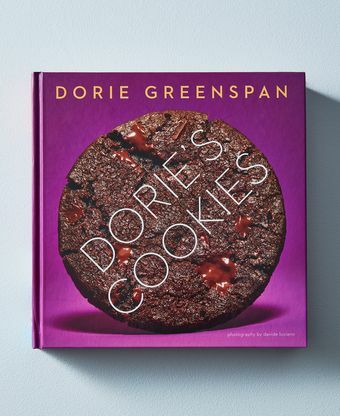 I’m not in a solid position to judge Greenspan’s achievement with Dorie’s Cookies: I don’t bake, unless you count Jiffy cornbread made twice a month from the instructions on the back of the box. But my wife and daughter are committed bakers—my wife once owned a baking company called Pink Frosting—and their reverence for Greenspan is as ardent and as complex as is Greil Marcus’ reverence for Bob Dylan. And so I enlisted their help. Greenspan is a cookie maniac, a cookie—let’s just say it—monster. She lives and breathes butter, flour, and sugar. “I’ve been known to get up in the middle of the night because I’ve invented a new cookie in my sleep,” she writes in her introduction. She adds: “Yes, I bake what I dream.” She is the author of eleven previous cookbooks, including Baking with Julia, written with Julia Child, and Baking from My Home to Yours. She is a three-time James Beard Award-winner. Her elfin face peeks from the spines of many of her books; she looks like Terry Gross’ sister from another planet. The recipes in this book cover enormous ground, from brownies and nut bars to everyday cookies to weekend-project cookies. Two sections, my favorites, deal with what her son, Joshua, calls “cookies for grown-ups.” (Together Greenspan and Joshua briefly ran a Manhattan cookie boutique called Beurre & Sel.) Who wants a grown-up cookie? I do, once in a while. Some of these are sophisticated because they’re small and well-tailored. Others, like so-called cocktail cookies, are savory and meant to be consumed alongside drinks. The recipes here include “Old Bay Pretzel-and-Cheese Cookies,” “Rosemary Parm Cookies” and “Parmesan Galettes,” and they make you want to prepare very fine cocktails indeed. My wife, Cree, made a few recipes from the Beurre & Sel recipes, including one for her elegant French Vanilla Sables. My daughter Harriet made the Sunny-Side Up Meringues, which resemble, delightfully, sunny-side-up eggs. These vanished in an instant. Countless other pages in Dorie’s Cookies are already turned down or marked with sticky pads. My wife and daughter know her books inside and out, and they are of the opinion that it might be her best yet. Because it is so comprehensive, and so bold, this is a reference book for the ages—a book to sit alongside my wife’s three go-to cookie sources: The King Arthur Flour Cookie Companion, Tartine, and the 1997 edition of The Joy of Cooking. 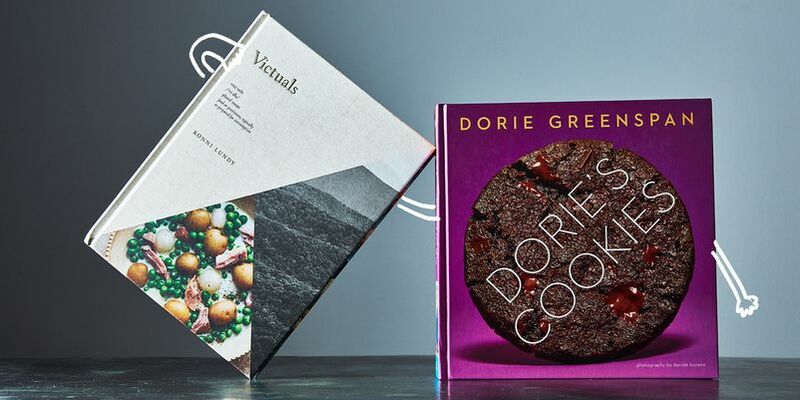 Though I venerate what Lundy is up to in Victuals, the winner of this head-to-head cookbook contest is Dorie’s Cookies. As if she were Yoda, Greenspan writes, “The cookie-verse is infinite.” The force is with her. What was your reaction to this review? I love The Southern Foodways Alliance. My children and grandchildren live in the South and I wanted to understand that food heritage more. I have Victuals and I found it to be so warm and inspiring. It is beautifully written. I wanted this to win. But Dorie hits all the right spots and in this particular pairing she is the winner. I've had 'Dorie's Cookies' since the day it came out! I love it and agree whole-heartedly with the review. This review has been one of my favorites to read and I want to purchase 'Victuals' because of it. I can't wait to try some of the recipes described. Not a lover of "sweets" and so favored "Victuals." Also, growing up in San Francisco, the Appalachian region's foods are total unknowns to me, so there's that. But I can see why, for this reviewer and his family, there was no contest. Sometimes I feel so left out when people rave about their cookie cravings. Sighing with a smile. I am a Dorie fan and felt she in fact was the winner but the reviewer wrote so thoughtfully about the competing book that I wanted a tie. I really hope that Dorris Greenspan hops on here just to tell us that Terry Gross is, in fact, her cousin. Ugh. Dorie. Autocorrect got me! I hopped on earlier in the thread, but forgot to mention that yes, indeed, Terri Gross and I were separated at birth. I think have a sweet and savory Piglet makes a lot of sense. There needs to be a way to really evaluate those books that don't necessarily fit the mold of the entire group of books. In 2014, Saving the Season was one of the entries. I think it was very difficult for the reviewers to evaluate a canning book in late fall. Maybe there should be some sort of seasonal competition in order to have the opportunity to evaluate a wider variety of books. Perhaps, all Piglet, all the time should be the theme. I know I look forward to this every year. Or give the review to someone on the west coast who will have access to enough fresh options to be able to select from a greater percentage of the book. Sorry– meant to say my comment was in response to Sauertea's lament on some books being given short shrift because of limitations the reviewer faced due to the book having innate seasonal requirements, as Saving the Season did back in 2014. I like this review. It is just a nice read. Victuals looks wonderful. But I was rooting for Dorie's Cookies. I have the cookbook and it is rock solid. I have made about 10 of the recipes so far. Every cookie has been delicious. She gives just the right amount of instruction. Things turn out. That said, I agree with the suggestion that there should be a sweet Piglet and a savory Piglet. More Piglets - yeah! Yes, totally! I actually had my hands on Dorie's book at the local Barnes & Noble. I will be picking it up soon. Perhaps next year there could be two piglets? One for savory and one for sweet cookbooks. That way we get twice as much piglet, and the books will get judged in their proper context. Ohh, the last two days of the Piglet have left me tense (!!!). Bravo to this reviewer for his even-keeled approach to reviewing two great books. The last two days have also made me wonder -- would you (the Food52 editors) ever consider a 'last chance kitchen' style rematch, or a way for a book (or two) to earn re-entry into the tournament? Not sure exactly how that'd work, but it'd add an extra layer of drama because there's not enough already (ha!). But no need to fix what's not broken, and I know a lot of extra work would be involved. This year's Piglet has been all kinds of enlightening -- not only do we get to learn about cookbooks that we'd otherwise overlook, we get such a unique glimpse into the *varied* perspectives of reviewers, and the fair (and sometimes unfair) assumptions and biases that we all bring to reading and using any cookbook. Gosh, I completely forgot about the wildcard round! Thanks for refreshing my memory Charlotte! I can't even imagine how much work goes into the Piglet. I love it every year, but especially this year! This was such a wonderful treat to wake up to this morning. I love Garner's writing and how thoroughly he explored both books' merits before coming to his decision. I especially admire his decision to enlist his family's help in judging Dorie's Cookies. My favourite Piglet judgements are ones in which the authors deeply consider the books before them and then come to a thoughtful conclusion, whatever their personal criteria. This year, my favourite reviews so far are from Garner and Rachel Khong. Both write beautifully and communicate their decisions lucidly. No wonder all the books they considered will have a home on my shelves. I own - and love - both these books. This has been the toughest match so far. I'd like both to go on to the next stage. But what I really loved about this review is Garner's writing. The first two paragraphs - that is a way to pull a reader in, with reference to literature that the reviewer loves, with a little information about his own background. It is a joyful read. It's sad these books were paired against each other, as they are both winners, and could not be more different. Frankly, being a life-long baker, I don't need another cookie book, no matter how wonderful. But Ronni's book definitely has a place in my library. Wow, some of you just can't stop taking swipes at yesterday's review. Move on people. I get that some of you really really like Simple, but are you really going to keep complaining about that review the rest of the way? This review is odd not because of the review (which I agree is well written and fair) but because of the matchup and that he didn't actually cook from Dorie's book. I'm unsurprised that his wife and daughter who love baking liked Cookies but I do wish he'd cooked from it himself. Both books, though, sounds wonderful in entirely different ways. Kudos. I agree. Too many complaints when we should be having fun. There will always be a loser in every round and great books always get knocked out. It's unfair to put a DG book up against anyone else's: her books are perfection, and - when I know there's one on the horizon - I pre-order it, sight unseen. The only downside: her books spoil me for any other (baking) books. Why oh why don't all cookbook authors give us weights as well as volume measures?! I've already said how much I like this review. Dwight Garner mentioned some books that are favorites in his house: 1997 Joy of Cooking, Tartine, and the King Arthur Flour Cookie Companion. I would love to hear some FOOD52ers comment on these books. For cookies, I love Alice Medrich's books, especially Pure Dessert, Chewy Gooey Crispy Crunchy Melt-in-Your-Mouth Cookies, and, a past Piget contender, Flavor Flours. I can't wait to get into Dorie's Cookies, which is sitting on my kitchen table. The King Arthur Cookie Companion is not Flashy.. no photographs, but lots and lots of cookies , both familiar and unfamiliar. I especially like that it has recipes for many popular cookies 3 ways: soft and chewy, crisp, and crunchy. You can adjust a few ingredients and have your snickerdoodles or oatmeal cookies just the way you like them.. highly recommended , by me. Jamcook, Thanks for this. The KA book sounds really good, especially the part about the texture of the cookies; I like crisp or crunchy. There seems to be a revised edition. Is yours hard- or soft-backed? Jamcook, I got the KA Cookie Companion so thanks for this recommendation. I actually Tweeted Dwight Garner to see if the book he mentioned was the 2004 edition or the 2013, and he Tweeted back the 2004. I was able to get it on Amazon.